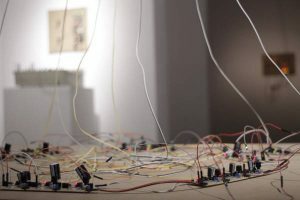 Symbolic Grounding is a kinetic light and sound installation that runs at its core by a network of 100 artificial analogue neurons. 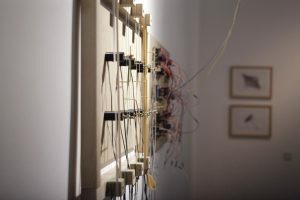 Timely patterns emerge as results of network connectivity and these patterns and their variations are made tangible through light sound and movement. 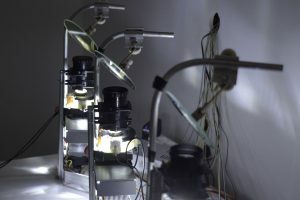 Symbolic Grounding is a kinetic light and sound installation by christian faubel and wolfgang spahn that runs at its core by a network of 100 artificial analogue neurons. In this network function, temporal structures, ordered sequences and coordination patterns emerge from the interaction of the artificial neurons and the connectivity of the network. 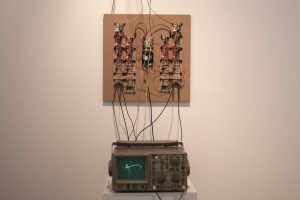 The installation renders these temporal structures and functions tangible and allows the visitor to experience the complexity of interactions happening in such a network. Our approach is guided by systems theory, one the one hand theoretical models that explain inter-limb coordination, specifically the coordination dynamics of finger tapping and on the other hand by models from theoretical neuroscience. Similar to the technique of using analog computers for solving complex equations , we use analogue electronics to run the equations for describing the temporal evolution of models of neural populations as proposed by Shun-Ichi Amari. 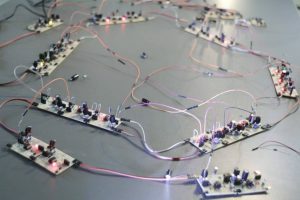 A neural Oscillator based on the Shun-Ichi Amari’s work by Christian Faubel and Wolfgang Spahn. Its an analog electronic implementation of the model described in dynamics of pattern formation in lateral-inhibition type neural fields by shun-ichi amari. 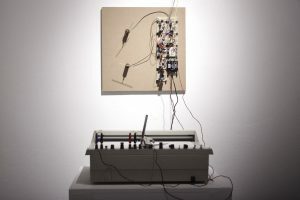 Simulation of two coupled neural oscillators by Christian Faubel.